Hunter green and navy blue is one of the most preferred color combination for many businesses because it projects lots of positivity. 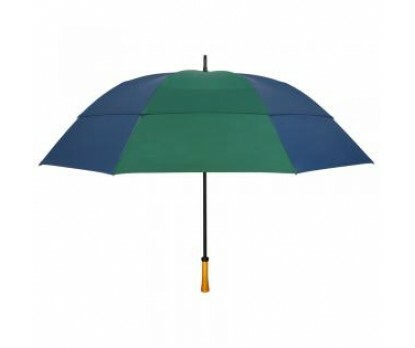 Customized navy & hunter green 64” arc vented golf umbrellas are hugely preferred by businesses, which have lots of both shades in their brand themes or which love to position themselves easily in customers mind. Another great advantage of employing logoed promotional navy & hunter green 64” arc vented golf umbrellas is that they can remain in good condition for a long time. 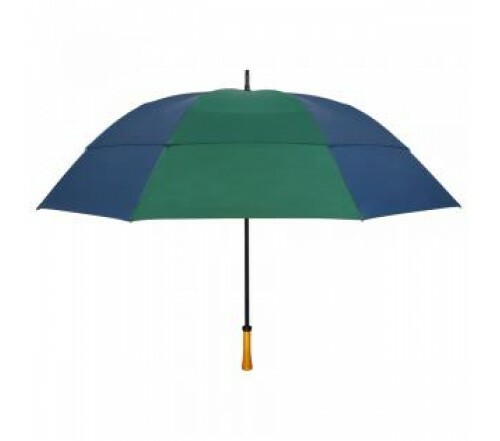 Custom navy & hunter green 64” arc vented golf umbrellas also make a good promotional choice for marketers who believe that first investment should be the best. Features - Fiberglass frame and wooden handle, nylon fabric, manual open function and windefyer vented canopy. Imprint area - 10"W x 5"H. Dimensions - 64" arc - Closes to 42".